The horizontal gaze nystagmus (HGN) test is one of the standardized field sobriety tests. This test gets its name from horizontal gaze nystagmus which refers to a quick movement or jerking of the eye as it moves side to side. This jerking motion, or nystagmus, is an indication of drug or alcohol impairment caused by the brain’s inability to properly control the eye muscles. To administer this test, a police officer will typically use a pen, a penlight or a finger and place it approximately twelve to fifteen inches in front of your nose and slightly higher than eye level. The police officer will then move the object horizontally and direct you to follow it with your eyes while keeping your head still. While your eyes are tracking, the police officer will examine each eye for three specific characteristics that indicate impairment. As the police officer completes this test on each eye, he should make a written note of the results. Three characteristics comprise the HGN test. First, the police officer checks each eye for lack of smooth pursuit. If you are unimpaired, both eyes should smoothly track from side to side. On the other hand, if the police officer observes nystagmus or jerking of the eye, it is noted as an indication of impairment. Second, the police officer checks each eye for distinct nystagmus at maximum deviation. In other words, the police officer first directs the left eye outward toward the left ear as far as possible and maintains this position for four seconds while checking for nystagmus or jerking of the eye. This procedure is then repeated for the right eye. Finally, the police officer checks each eye for angle of onset of nystagmus prior to forty-five degrees. For this characteristic, the police officer notes the presence of nystagmus or jerking of the eye at the forty-five degree location between your nose and shoulder. Although the HGN test is commonly touted as the most accurate of the three standardized field sobriety tests, it is not always admissible at trial as evidence of impairment if the test is not administered properly. Additionally, the HGN test results may not be admissible if the prosecutor fails to lay the proper evidentiary foundation at trial. PLEASE TAKE NOTICE THAT THE ASSEMBLY AND OVERALL APPEARANCE OF THE CONTENT OF THIS WEBSITE AS WELL AS THE CONTENT, ITSELF, INCLUDING BUT NOT LIMITED TO ANY AND ALL IMAGES, GRAPHICS, DESIGNS, SOFTWARE, AUDIO OR LOGOS CONTAINED ON THIS WEBSITE ARE THE EXCLUSIVE PROPRIETARY PROPERTY OF FieldSobrietyTests.Net AND ARE FULLY PROTECTED BY U.S. AND INTERNATIONAL COPYRIGHT LAWS (FOR ADDITIONAL INFORMATION, SEE WWW.COPYRIGHT.GOV). PLEASE BE ADVISED THAT ANY AND ALL UNAUTHORIZED USE, INCLUDING BUT NOT LIMITED TO REPUBLICATION AND REPRODUCTION, OF ANY CONTENT CONTAINED ON THE WEBSITE IS ILLEGAL AND PROHIBITED BY U.S. AND INTERNATIONAL COPYRIGHT LAWS. THE OWNERS OF FieldSobrietyTests.Net WILL SEEK PENALTIES TO THE FULLEST EXTENT OF THE LAW AGAINST ANY INDIVIDUAL OR COMPANY WHO WITHOUT AUTHORITY USE THE CONTENT OF THIS WEBSITE. 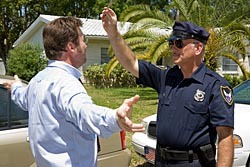 DISCLAIMER: FieldSobrietyTests.Net PROVIDES THE INFORMATION IN THIS WEB SITE FOR INFORMATIONAL PURPOSES ONLY. THE INFORMATION IS NOT INTENDED TO BE LEGAL ADVICE AND SHOULD NOT BE CONSTRUED AS SUCH. THE USE OF THIS SITE DOES NOT CREATE AN ATTORNEY-CLIENT RELATIONSHIP. Copyright © FieldSobrietyTests.Net, All Rights Reserved.